All of Simply7's Quinoa Chip flavours are designed to deliver all the flavour and nutrients of the ancient super grain quinoa. Sea Salt is the “original” flavour and truly brings out the slightly nutty flavour of quinoa. 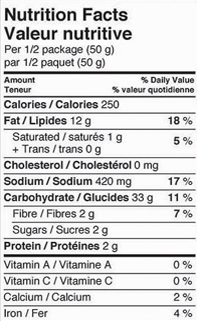 You might expect Sea Salt to be similar to the flavours of other basic salted snacks but it is so much more. The unique flavour of quinoa and the light dusting of sea salt makes for a snacking experience that will keep you reaching for more! Ingredients: Quinoa Flour, Potato Starch, Corn Starch, Expeller Pressed Safflower Oil, Corn Flour, Sugar, Sea Salt. My daughter loves these chips. She suffers from acid reflux and these quinoa chips donâ€™t upset her stomach. Also well.ca is the only place I can get them online at a reasonable price. One of my all time favorites. Delicious taste and highly addictive- the oil, salt, and crunch. Hard to find in stores so I'm glad they are still available online. Would give 5 stars if the quantity was greater and the price lower. 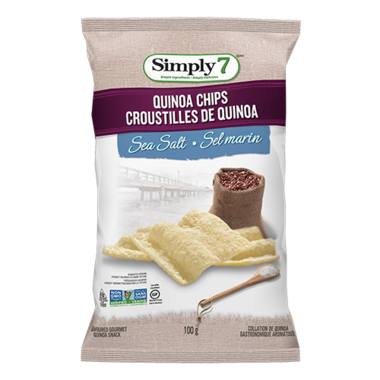 Love Simply7's Quinoa Chip - Sea Salt! They are a delicious treat to eat, or when crushed up used as an alternative to breadcrumbs/panko crumbs. They are light and full of flavour, a good alternative to potato chips! Love these. Great alternative to potato chips. Nice with a sandwich. Great alternative to regular chips. If you're going to go with "chips" I feel these are the best "healthy" choice. They don't taste good to me at all, did not like them. Won't be buying them again. A great substitute when you have the munchies. Popular with everyone in our house! Great alternative to chips !! These are good but I wish they would bring the hummus chips in from the same company. Those are my favorite. I like these but they have a slightly bitter aftertaste. Good tasting product! I would buy again. Satisfied the crunch craving. Pleasantly surprised, this was a great tasting Chip. High in protein as well. Better for you than eating potato chips!